"Assessing Personal Injury Liabilities in China from National to Provincial Level: An International Comparative Analysis"
Abstract: In a tort-based legal system, when a party is injured as a consequence of another party’s negligence, the party should be provided with sufficient compensation so that he or she may live as fulfilling a life as possible after the injury. The moral objective underlying this supposition is intuitively appealing. It is not surprising, therefore, that this jurisprudential notion is favourably regarded and widely applied in various common law and civilian jurisdictions, despite differences in tradition and culture. Nonetheless, although the two bodies of law share a similar objective in this respect, there are a number of differences in the substantive content of the law and the configuration of the rules. The present authors argue, and provide empirical evidence to support, that there are signs of convergence as both legal systems are in fact applying the same multiplicand-multiplier approach in assessing the quantum of damages. 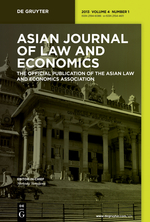 Case studies in mainland China (concerning civil law) and in the United Kingdom and Hong Kong (regarding common law) are adopted as the research methodology to explore the broader implications of this convergence.